I am proposing a new theory for the study of the reactivity organic reactions, named Molecular Electron Density Theory (MEDT), which is based on the idea that while the electron density distribution at the ground state is responsible for physical and chemical molecular properties, as proposed Density Functional Theory (DFT), the capability for changes in electron density, and not molecular orbital interactions, is responsible for molecular reactivity (RSC Adv. 2014, 4, 32415). Therefore, the reactivity in organic chemistry cannot be characterised neither by a static energy nor by a geometrical study of the corresponding stationary points, including the transition state structures, but by a rigorous analysis of the molecular electron density changes along the reaction path, as well as of the changes in energies required to reach the transition state geometry in order to explain experimental activation energies. - The rules of conservation of orbital symmetry. - The Frontier Molecular Orbital Theory. - The distortion/interaction reactivity model. Most of our recent theoretical studies devoted to relevant organic reactions such as Diels-Alder reactions (Org. Biomol. Chem. 2009, 7, 3576), the Friedel-Cafts reaction (RSC Adv. 2013, 3, 7520), [3+2] cycloaddition reactions (Tetrahedron 2014, 70,1267; RSC Adv. 2015, 5, 58464), the Povarov reaction (RSC Adv. 2014, 4, 25268), the ene reaction (Org. Biomol. Chem. 2014, 12, 7581), and recently, the ketene-imine Staudinger reaction (RSC Adv. 2014, 4, 58559, RSC Adv. 2015, 5, 37119), have been performed using the proposed MEDT. 1. Understanding the high reactivity of carbonyl compounds towards nucleophilic carbenoid intermediates generated from carbene isocyanides. RSC Adv. 2015, 5, 84797-84809. 2. A new model for C-C bond formation processes derived from the Molecular Electron-Density Theory in the study of the mechanism of [3+2] cycloaddition reactions of carbenoid nitrile ylides with electron-deficient ethylenes. Tetrahedron 2016,72, 1524-1532. 3. 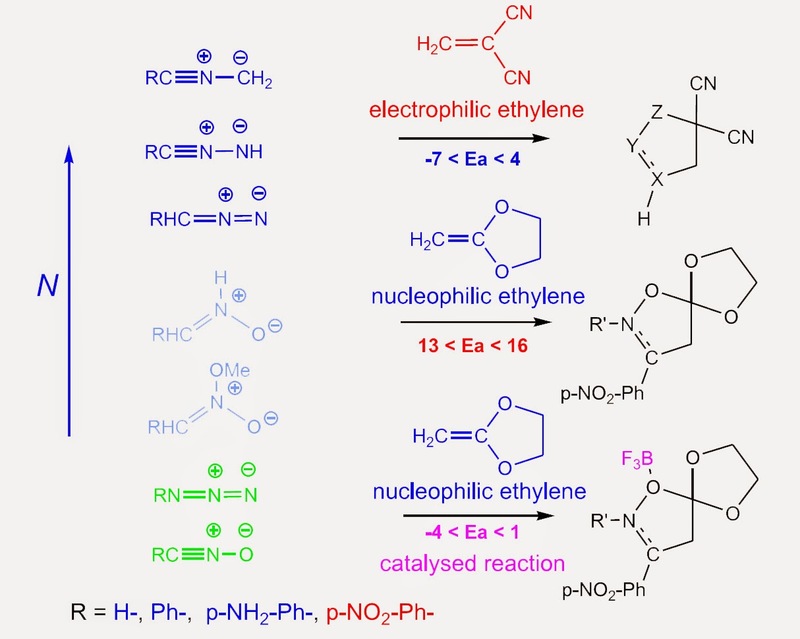 Understanding the carbenoid-type reactivity of nitrile ylides in [3+2] cycloaddition reactions towards electron-deficient ethylenes. A molecular electron density theory study. Theor. Chem. Acc. 2016, 135, 160. Organic Chemistry Reactivity. Molecules 2016, 21, 748. Download the Review . 5. An MEDT study of the carbenoid-type [3+2] cycloaddition reactions of nitrile ylides with electron-deficient chiral oxazolidinones. Org. Biomol. Chem. 2016, 14, 10427 - 10436. 6. 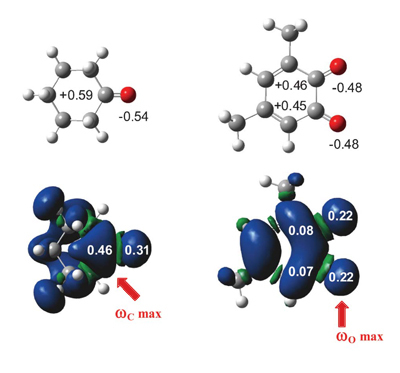 Electrophilic activation of CO2 in cycloaddition reactions towards a nucleophilic carbenoid intermediate: new defying insights from the Molecular Electron Density Theory. Theor. Chem. Acc. 2017, 136:1. 7. A Molecular Electron Density Theory Study of the [3+2] Cycloaddition Reaction of Nitrones with Ketenes. Org. Biomol. Chem. 2017, 15, 1618–1627. 8. How does the Global Electron Density Transfer Diminish Activation Energies in Polar Cycloaddition Reactions? A Molecular Electron Density Theory Study. Tetrahedron 2017, 73, 1718-1724 . 9. Understanding the domino reactions between 1-diazopropan-2-one and 1,1-dinitroethylene. A molecular electron density theory study of the [3+2] cycloaddition reactions of diazoalkanes with electron-deficient ethylenes. RSC Adv. 2017, 7, 15586–15595. 10. Steric interactions controlling the syn diastereofacial selectivity in the [3+2] cycloaddition reaction between acetonitrile axide and 7-oxanorborn-5-en-2-ones. A Molecular Electron Density Theory study. J. Phys. Org. Chem. (2017). 11. A Molecular Electron Density Theory Study of the Reactivity of Azomethine Imine in [3+2] Cycloaddition Reactions. Molecules 2017, 22, 750. 12. 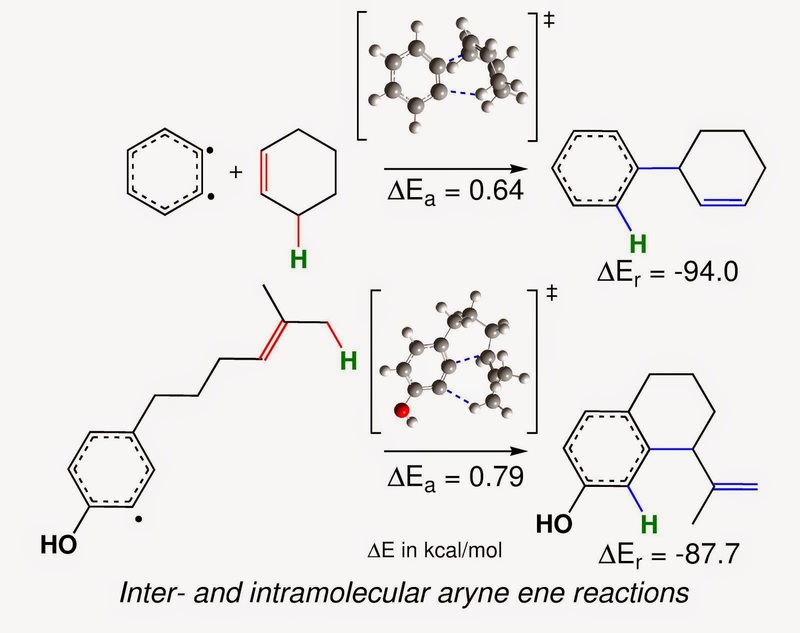 A Molecular Electron Density Theory Study of the [3+2] Cycloaddition Reaction of Nitrones with Strained Allene. RSC Adv. 2017, 7, 26879-26887. 13. Steric interactions controlling the syn diastereofacial selectivity in the [3+2] cycloaddition reaction between acetonitrile axide and 7-oxanorborn-5-en-2-ones. A Molecular Electron Density Theory study. J. Phys. Org. Chem. 2017. 14. Understanding the Reactivity and Regioselectivity of [3+2] Cycloaddition Reactions between Substituted Nitrile Oxides and Methyl Acrylate. A Molecular Electron Density Theory Study. Int. J. Quantum Chem. 2017. 15. A Molecular Electron Density Theory study of [3+2] cycloaddition reactions of chiral azomethine ylides with ß-nitrostyrene. Theor. Chem. Acc. 2017, 136:104. 16. Understanding the Intramolecular Diels-Alder Reactions of N-Susbtituted N-allyl-furfurylamines. An MEDT Study. ChemistrySelect 2017, 2, 9736. 17. Understanding the mechanism of the decomposition reaction of nitroethyl benzoate through the Molecular Electron Density Theory. Theor. Chem. Acc. 2017, 136:129. Chemical Physics 2018, 501, 128-137. 19. Experimental and Theoretical MEDT Study of the Thermal [3+2] Cycloaddition Reactions of Aryl Azides with Alkyne Derivatives. ChemistrySelect 2018, 3, 1215– 1223. 20. The Mysticism of Pericyclic Reactions. A Contemporary Rationalisation of Organic Reactivity Based on the Electron Density Analysis. Eur. J. Org. Chem. 2018, 1107–1120. 21. 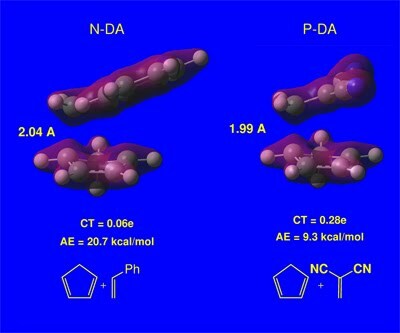 A Molecular Electron Density Theory Study of the Reactivity and Selectivities in [3+2] Cycloaddition Reactions of C,N-Dialkyl Nitrones with Ethylene Derivatives. J. Org. Chem. 2018, 83, 2182−2197. 22. A Molecular Electron Density Theory study of the [3+2] cycloaddition reaction between an azomethine imine and electron deficient ethylenes. J. Phys. Org. Chem. 2017, 31:e3830. 23. Molecular Electron Density Theory Study of Fused Regioselectivity in the Intramolecular [3+2] Cycloaddition Reaction of Nitrones. ChemistrySelect 2018, 3, 5412–5420. 24. A Molecular Electron Density Theory Study of the Role of the Copper-Metallation of Azomethine Ylides in [3+2] Cycloaddition Reactions. J. Org. Chem. 2018, 83, 10959-10973. 25. A Molecular Electron Density Theory Study of the Competitiveness of Polar Diels-Alder and Polar Alder Ene Reactions. Molecules 2018, 23, 1913. 26. A Molecular Electron Density Theory Study of the Chemoselectivity, Regioselectivity and Diastereofacial Selectivity in the Synthesis of an Anti-Cancer Spiro-Isoxazoline derived from α-Santonin. Molecules 2019, 24, 832. In 1926, Schrödinger published the so-called Schrödinger equation, which describes the electronic structure for a system formed by a set of nuclei and the corresponding electrons. Due to the complexity of the mathematical resolution of the Schrödinger equation for organic molecules containing a few atoms, a series of physical/ mathematical approaches were developed. One of them was the Molecular Orbital theory (MOT), in which the wavefunction Y is obtained as the sum of a series of simpler wavefunctions Yi named molecular orbitals (MOs). The simplest approach to the MOT was the Hückel molecular orbital theory (HMOT) established in 1930, in which only valence atomic orbitals (AOs) are used to build MOs. In the simplest HMOT, only pz AOs were used in the study of planar unsaturated molecules. This very simple approach, which is widely used in organic chemistry nowadays, was employed in the 50s of the last century to establish important organic reactivity models such as the pericyclic mechanism for cycloaddition reactions, as well as the frontier molecular orbital (FMO) theory for the study of the reactivity in organic chemistry. Today, the HMOT is too simple to describe the structure and reactivity of organic molecules. On the other hand, the total electron density obtained from MO calculations comes from the sum of the occupied MOs, the individual analysis of any MO has no physical significance. In the last decade of the last century, first Bader and later Becke and Edgecombe established quantum tools allowing the topological analysis of the electron density, i.e. Atoms in Molecules (AIM) and Electron Localisation Function (ELF). While AIM enables a partition of the electron density within the molecular space into basins associated with atoms, ELF constitutes a useful relative measure of the electron pair localisation characterising the corresponding electron density. Silvi and Savin presented the ELF in a very chemical fashion, using their topological analysis as an appealing model of chemical bonding. From the beginning of the present century, theoretical organic chemists have had powerful quantum-chemical tools at their disposal to perform a rigorous analysis of the changes of electron density along a reaction channel and thus to establish reactivity in organic chemistry. Numerous works carried out in this century by recognised scientists have demonstrated the ability of these tools to study reactivity in organic chemistry. Consequently, from my point of view, the use of the FMO theory to study reactivity in organic chemistry is completely out of date, necessitating a rigorous analysis of the changes of electron density along an organic reaction. Theoretical reactivity indices based on the conceptual Density Functional Theory (DFT) have become a powerful tool for the semiquantitative study of organic reactivity. A large number of reactivity indices have been proposed in the literature. Herein, global quantities like the electronic chemical potential m , the electrophilicity w and the nucleophilicity N indices, and local condensed indices like the electrophilic and nucleophilic P(r) Parr functions, as the most relevant indices for the study of organic reactivity, are discussed. The high nucleophilic character of carbenoid intermediate cis-IN together with the specific approach mode of acetone make the formation of the C-C single bond with a very low activation free energy, possible. The proposed MEDT model allows explaining the reaction mechanism of these cycloaddition reactions as a [2n+2n] cycloaddition. This study makes it possible to reject a recently proposed theoretical study based on the obsolete FMO theory, which proposes a 1,3-dipolar cycloaddition mechanism for these reactions (J. Org. Chem., 2014, 79, 10811). Thanks to those who have contributed to this vast work, and those who have read and cited the corresponding publications. I have recently been appointed as a Fellow of the Royal Society of Chemistry (31/10/2014). I would like to thank the people of the RSC that have made the appointment possible. 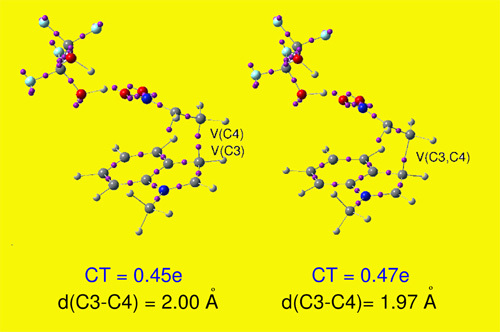 A New C-C Bond Formation Model Based on the Quantum Chemical Topology of Electron Density. ELF topological analyses of bonding changes in non-polar, polar and ionic organic reactions involving the participation of C=C(X) double bonds make it possible to establish a unified model for C-C bond formation. This model is characterised by a C-to-C coupling of two pseudoradical centers generated at the most significant atoms of the reacting molecules. The global electron density transfer (GEDT) process that takes place along polar and ionic reactions favours the creation of these pseudoradical centers at the most nucleophilic/electrophilic centers of the reacting molecules, decreasing activation energies. The proposed reactivity model based on the topological analysis of the changes in electron density along a reaction makes it possible to reject the frontier molecular orbital reactivity model based on the analysis of molecular orbitals. Pseudodiradical structures and GEDT involved in the C-C single bond formation in non-polar, polar and ionic organic reactions. Pseudodiradical-type(pr-type) 32CA reactions. These reactions are chacaterised by taking place with a very low activation energy and a very low global electron density transfer (GEDT) at the transition state structure (TS). Carbenoid-type (cb-type) 32CA reactions. The feasibility of these reactions depends on their polar character,i.e. the nucleophilic character of the carbenoid TAC and the electrophilic character of the ethylene derivative. Zwitterionic-type (zw-type) 32CA reactions. Like cb-type reactions, the feasibility of these reactions depends on their polar character,i.e. the nucleophilic character of the zwitterionic TAC and the electrophilic character of the ethylene derivative or vice versa. L. R. Domingo, S. R. Emamian,Tetrahedron 2014, 70, 1267-1273. 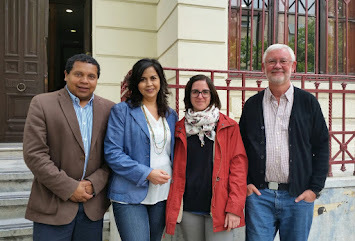 L. R. Domingo, M. Ríos-Gutiérrez, P. Pérez, Tetrahedron 2016, 72, 1524-1532. Non-classical CH···O hydrogen-bond determining the regio- and stereoselectivity in the [3 + 2] cycloaddition reaction of (Z)-C-phenyl-N-methylnitrone with dimethyl 2-benzylidenecyclopropane-1,1-dicarboxylate. A topological electron-density study. The presence of the two CO2Me groups in the cyclopropane ring has a remarkable eﬀect on selectivities favouring the ortho/endo path, in good agreement with the experimental data. Non-covalent interaction (NCI) analysis of the most favourable ortho/endo transition state structure reveals that the formation of a non-classical CH···O hydrogen-bond involving the nitrone C–H hydrogen is responsible for the selectivity experimentally found in this non-polar zw-type 32CA reaction. An electron localisation function (ELF) topological analysis along the most favourble reaction path allows explaining the formation of the C–C and O–C bonds through a non-concerted two-stage one-step mechanism. Diels-Alderase Catalysing the Cyclisation Step in the Biosynthesis ofSpinosyn A: Reality or Fantasy? Luis R. Domingo, Jose A. Sáez, Lydia Rhyman and Ponnadurai Ramasami. The conversion of putative macrocyclic lactone into the tricyclic compound, as a key step in the biosynthesis of spinosyn A reported by Kim et al. (Nature, 2011, 473, 109), has been theoretically investigated using DFT methods. The relatively low activation free energy computed for the cyclisation process of the actual macrocyclic lactone, 21.0 kcal/mol, furnishes a rationalisation for a spontaneous (i.e. non-enzymatically catalysed) cyclisation process in the biosynthesis of spinosyn A. A geometrical analysis of putative macrocyclic lactone indicates that a slight strain on the lactone at the active site of the SpnF gene could decrease the activation free energy to ca. 16 kcal/mol. This non-specific participation of the enzyme, which accounts for the relatively low 500-fold acceleration that Kim et al. found in this gene, rules out the participation a specific Diels-Alderase. A DFT Study of the Mechanism of Brønsted Acid Catalysed Povarov Reactions. The molecular mechanism of the Brønsted acid (BA) catalysed Povarov reaction of N-phenyl-C-methoxycarbonyl imine with a methylene-cyclopropane (MCP) has been investigated using DFT methods at theMPWB1K/6-31G(d) level. This BA catalysed Povarov reaction is a domino process initialised by the formation of acationic intermediate which experiences a quick intramolecular Friedel-Craft reaction yielding the final tetrahydroquinoline.Protonation of imine nitrogen atom notably increases the electrophilicity of the corresponding species, accelerating the reaction through ionic processes. 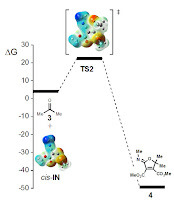 Analysis of the Parr functions in the initial nucleophilic attack of MCP to the protonated imine allows explaining the total regioselectivity experimentally observed. An electron localisation function quantum topological analysis of the bonding changes along the BA catalysed Povarov reaction permits a complete characterisation of the molecular mechanism. 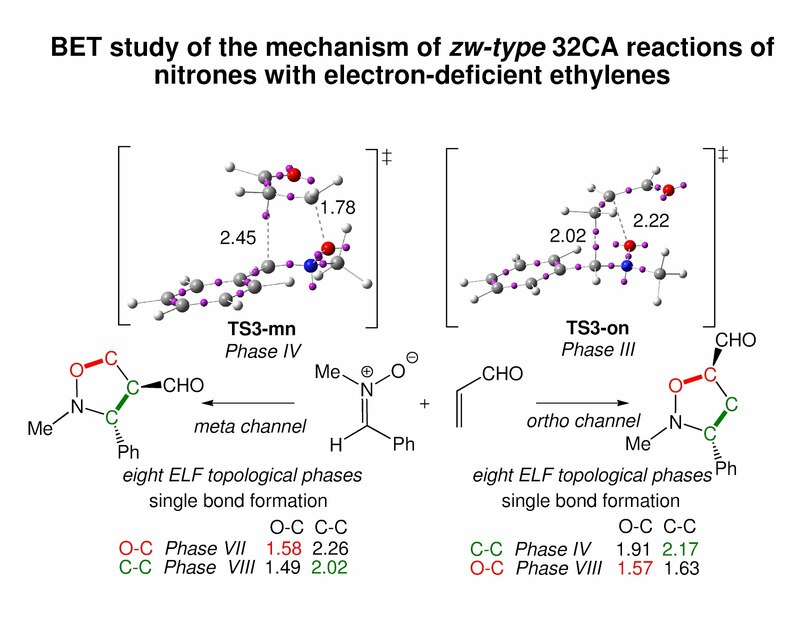 The mechanism of zw-type [3+2] cycloaddition (32CA) reactions of nitrones with electron-deficient (ED) ethylenes has been studied using density functional theory (DFT) methods at the MPWB1K/6-31G(d) level of theory. An exploration of the potential energy surfaces associated with the four competitive reactive channels of the 32CA reaction between C-phenyl-N-methyl nitrone and acrolein indicates that the cycloaddition reaction takes place through a one-step mechanism. This cycloaddition reaction presents a moderate metaregioselectivity and a complete endo stereoselectivity, which is diminished in dichloromethane. 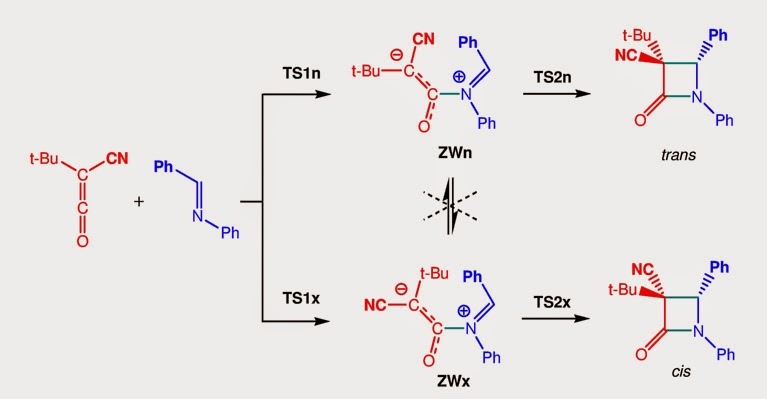 Analysis of the DFT reactivity indices of the reagents allows explaining the participation of nucleophilic nitrones in zw-type 32CA reactions towards ED ethylenes. A bonding evolution theory (BET) study of the two endo regioisomeric reactive channels allows establishing the molecular mechanism of these relevant 32CA reactions. Both regioisomeric channels topologically take place along eight differentiated phases. While the formation of the C-C single bond follows Domingo’s recently proposed model, the formation of the O-C single bond takes place at the short distance of 1.6 Å through the donation of some electron density of the oxygen lone pairs of the nitrone to the b-conjugated carbon atom of acrolein. 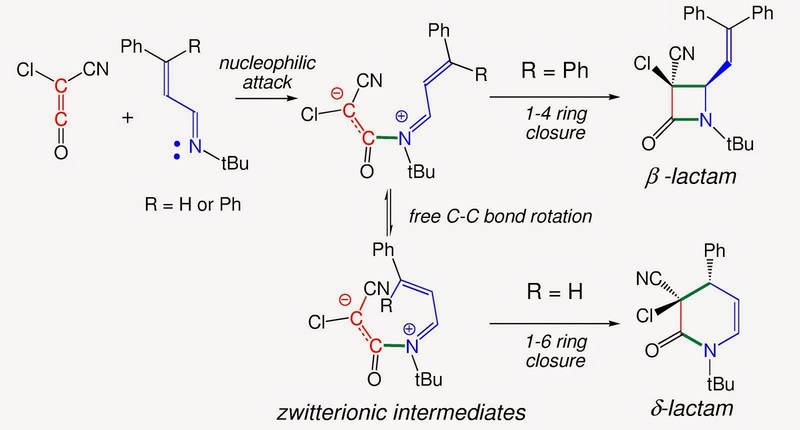 BET supports the non-concerted nature of these zw-type32CA reactions and makes it possible to reject the pericyclic mechanism proposed for them. The mechanism of the ketene-imine Staudinger reaction (KI-S) between t-butyl-cyano ketene and N-phenyl phenylimine has been studied using DFT methods at the MPWB1K/6-311G(d) computational level. The reaction takes place through a two-step mechanism: i) the first step is the nucleophilic attack of the imine nitrogen lone pair on the central carbon of the ketene yielding a zwitterionic (ZW) intermediate; ii) the second step, which is the rate- and stereoselectivity-determining step, is a ring-closure process achieved by a nucleophilic attack of the terminal carbon atom of the ketene on the imine carbon atom. Due to the unfeasibility of a cis/trans and an E/Z stereoisomerisation at the ZW intermediates, trans and cis b-lactams are formed along the endo and exo stereoisomeric channels, respectively. An electron localisation function (ELF) quantum topological analysis of the bonding changes along the KI-S reaction permits a complete characterisation of the mechanism. The first step is associated with the formation of the N1-C4 single bond along the nucleophilic attack of imine nitrogen lone pair on the central carbon of ketene, while the second step is associated with a ring-closure process achieved by the C-to-C coupling of the C2 and C3 pseudoradical centers generated in the previous phases. The present theoretical study makes it possible to reject those analyses based on the FMO theory, in which HOMO/LUMO interactions along the nucleophilic attack of the imines on the ketenes and a feasible torquoelectronic effect along the conrotatory ring-closure step control the cis/trans stereoselectivity in the formation of b-lactams. The molecular mechanism of the inter- and intramolecular aryne ene reactions has been theoretically studied using DFT methods at the MPWB1K/6-311G(d,p) level. These reactions take place through a one-step mechanism via nearly asynchronous TSs in which the C-C single bond formation is slightly more advanced than the hydrogen transfer process. These ene reactions show very low activation enthalpies (< 1kcal/mol) being strongly exothermic by more than 73 kcal/mol. An electron localisation function (ELF) topological analysis of the changes of electron density along these ene reactions indicates that the bonding changes are non-concerted. ELF topological analysis of the electron density in the C1-C2 bonding region of benzyne points out that the 1,2-pseudodiradical vinyl structure more than a CC triple bond one is responsible for the very high reactivity of these species. A DFT Study of the Ionic [2+2] Cycloaddition Reactions of Keteniminium Cations with Terminal Acetylenes. 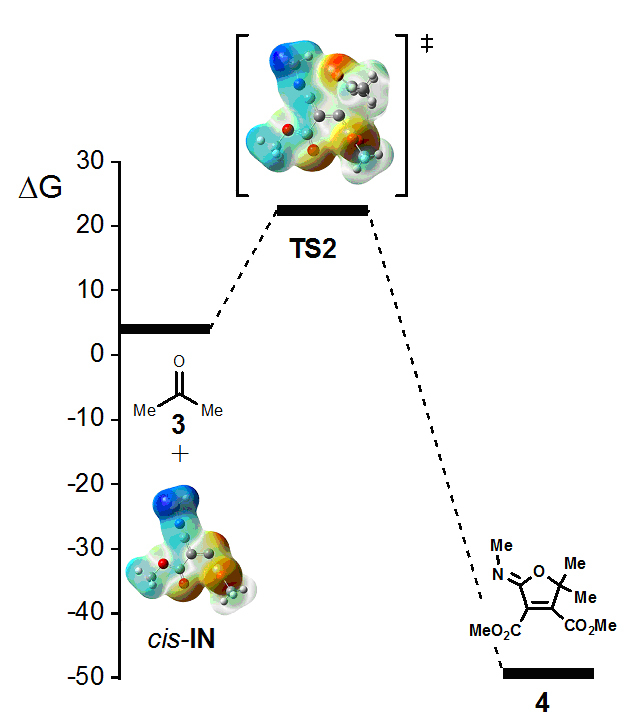 The molecular mechanism of the ionic [2+2] cycloaddition (I-22CA) reactions of a keteniminium cation (KC) with acetylene and propyne has been investigated using DFT methods at the MPWB1K/6-311G(d,p) level. These I-22CA reactions take place via a two-step mechanism. The first step is the nucleophilic attack of these alkynes on the central carbon of KC, yielding cyclopropene intermediates, while the second step corresponds to the conversion of these intermediates into more stable cyclobuteniminium cations (CCs). The first step is the rate-determining step, while the second step is responsible for the formation of the two regioisomeric CCs experimentally observed in the reaction with propyne. Analysis of the DFT reactivity indices indicates that the strong electrophilic character of KC accounts for the feasibility of these I-22CA reactions. An ELF topological analysis of the changes of the electron density along the IRCs of the two reaction steps allows the molecular mechanism of these I-22CA reactions to be established. A Mechanistic Study of the Participation of Azomethine Ylides and Carbonyl Ylides in [3+2] Cycloaddition Reactions. The participation of azomethine ylides (AYs) and carbonyl ylides (CYs) in [3+2] cycloaddition (32CA) reactions has been analysed at the DFT B3LYP/6-31G(d) level. The asymmetric substitution breaks the pseudodiradical character of the simplest three-atom-components (TACs), modifying their electrophilic and nucleophilic behaviours. 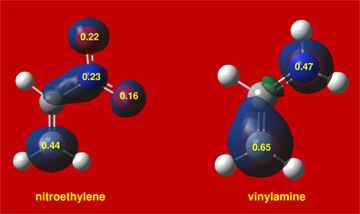 These TACs react quickly towards electrophilic nitroethylene. However, while the reaction with AY takes place via a zw-type mechanism, the reaction with CY appears to take place via a pr-type mechanism. A different behaviour is found in the reactivity towards the nucleophilic methyl vinyl ether. While AY presents a high activation energy, CY presents a high reactivity via a pr-type mechanism. 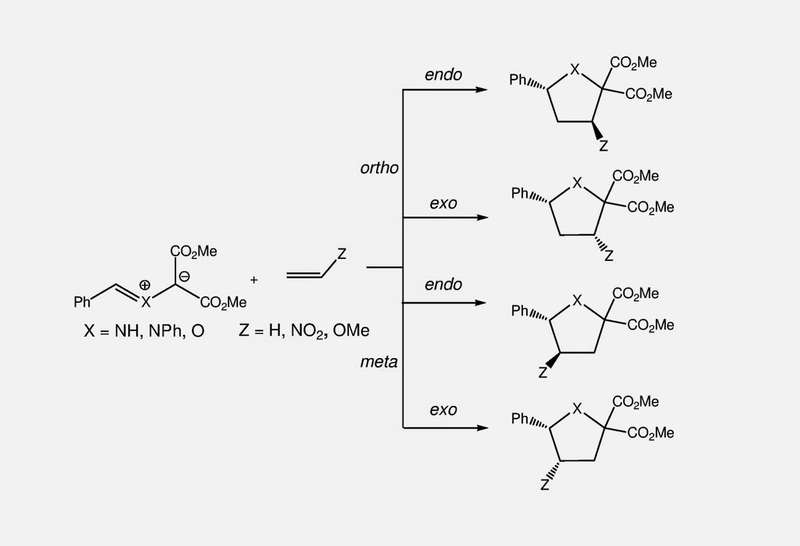 These reactions are completely regioselective, displaying exo stereoselectivity. The present study makes it possible to establish that the substitution provokes a different reactivity pattern in these TACs; while in CYs does not substantially modify their pr-type reactivity, AYs only participate in zw-type 32CA reactions towards electrophilic ethylenes. Why Houk's distortion/interaction energy model is an erroneous reactivity model. Houk's distortion/interaction [J. Am. Chem. Soc., 2007, 129, 10646] model based on the fragmentation of the TS geometry is conceptually erroneous as both molecular energy and geometry depend on the electron-density, which physically is not divisible. Since the computed E*distorsion (E*d) is always higher than the real one, this model always underestimate the interaction energy E*int, which is the factor responsible for the feasibility of an organic reaction. In this short manuscript, why Diels-Alder reactions are non-concerted processes is analyzed. Recent ELF topological analyses of cycloaddition mechanisms have evidenced that bonding changes take place along a sequential bond-breaking/bond-formation process. The most relevant topological behavior along these reactions is the formation of the new C-C single bonds by coupling of two pseudoradical carbons. Formation of these pseudoradical carbons is attained through the depopulation of the C-C double bonds present in the diene and ethylene. This demand provokes the rupture of the C-C double bonds at the begging of the reaction, and before the formation of the new C-C single bonds. Consequently, the C=C breaking and the C-C bond formation processes are non-concerted processes. The point IRC-12 of the intermolecular DA reaction of 1-(hex-5-enyl)cyclohexa-1,3-diene shows that while the formation of the C1-C5 bond has begun, see the presence of the V(C1,C5) disynaptic basin, the formation of the C4-C6 bond has not started; see the presence of the V(C4) and V(C5) monosynaptic basins. On the other hand, formation of C2-C3 double bond takes place at the end of the reaction. Understanding the selectivity in the formation of d-lactams vs b-lactams in the Staudinger reactions of chloro-cyan-ketene with unsaturated imines. An DFT study. The reactions of chloro-cyan-ketene with two phenyl substituted unsaturated imines yielding b- or d-lactams have been investigated using DFT methods at the MPWB1K/6-311G(d,p) level in diethyl ether. The reactions are initialised by the nucleophilic attack of the unsaturated imines on the ketene with formation of zwitterionic intermediates. The subsequent C-C single bond formation at the imine carbon or at the b-conjugated position enables the formation of b- or d-lactams. Analysis of the energies involved in the two competitive channels explains the selectivity experimentally observed; in the absence of any steric hindrance, formation d-lactams is favoured over the formation of b-lactams. ELF topological analysis allows explaining the bonding changes along the two competitive channels. While formation of the N-C bond takes place by participation of the nitrogen lone pair, formation of the C-C bonds takes place through a retrodonation process involving the C-C double bond of the ketene and the C-N or C-C double bonds of the unsaturated imine. ELF topological analysis makes it possible to rule out an electrocyclic mechanism for the cyclisation step. Understanding the Polar Mechanism of the Ene Reaction. The molecular mechanism of ene reactions has been characterised using DFT methods at the MPWB1K/6-311G(d,p) level of theory. Most reactions take place along a two-stage one-step mechanism in which the C-C bond formation takes place before the hydrogen transfer process. 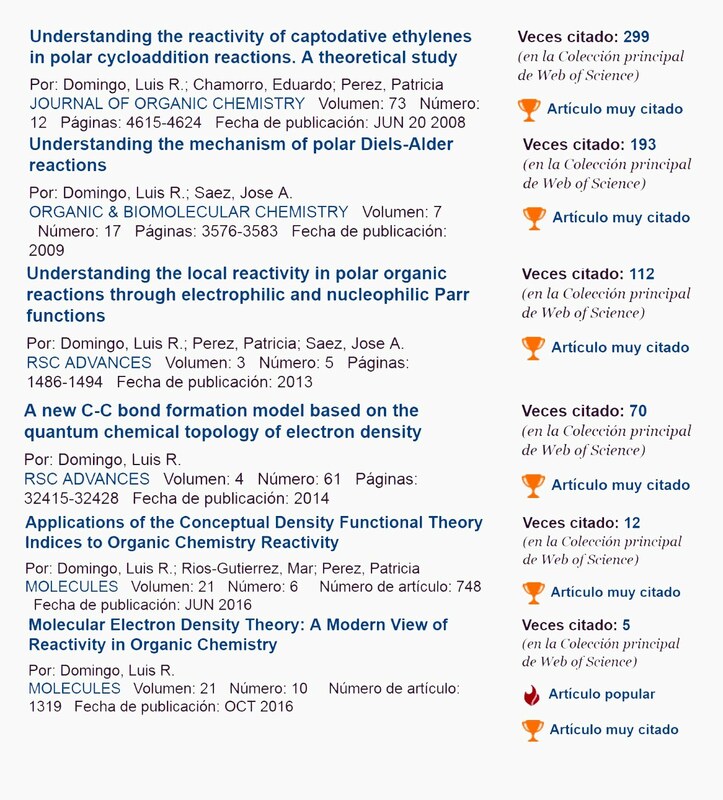 A very good correlation between the polar character of the reaction measured by the global electron density transfer at the transition state and the activation energy has been found. This behaviour allows establishing a useful classification of ene reactions in N-ene, having a very high activation energy, P-ene reactions having activation energies between 35 - 20 kcal/mol, and H-ene reactions having activation energies below 20 kcal/mol. ELF topological analysis permits the characterisation of the two-stage one-step mechanism associated with a two-centre nucleophilic /electrophilic interaction. Formation of the C-C single bond is achieved by the C-to-C coupling of two pseudodiradical centres formed at the two interacting carbon atoms in the first stage of the reaction. This topological analysis establishes that bonding changes are non-concerted. Finally, a DFT reactivity analysis makes it possible to characterise the electrophilic/nucleophilic behaviours of the reagents involved in ene reactions, and consequently, to predict the feasibility of ene reactions. Understanding the Mechanism of the Povarov Reaction. A DFT study. The molecular mechanism of the Povarov reaction in acetonitrile has been studied at the MPWB1K/6-311G** level of theory. This reaction follows a domino process that comprises two sequential reactions: i) a Lewis acid catalysed aza-Diels-Alder (A-DA) reaction between a N-aryl imine and a nucleophilic ethylene yielding a formal [4+2] cycloadduct; ii) a stepwise 1,3-hydrogen shift at this intermediate affording the final tetrahydroquinoline. At this computational level, the Lewis acid catalysed A-DA reaction presents a two-step mechanism as a consequence of the large stabilisation of the corresponding zwitterionic intermediate. Our study allows establishing that the N-aryl substituent has no remarkable incidence in the activation energy, but the presence of a second C-aryl substituent has a relevant role in the reaction rate. 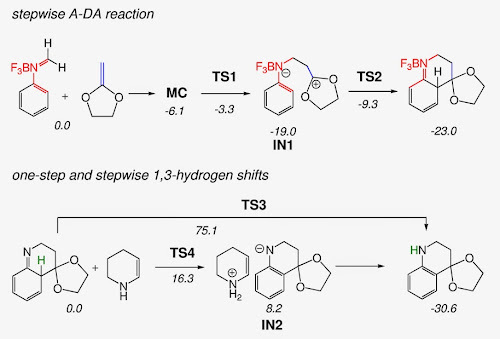 Analysis of the DFT-based reactivity indices of the reagents provides further explanation of the behaviours of the mechanism of the A-DA reaction involved in the Povarov reaction. Unlike Diels-Alder reactions, which can be classified as non-polar Diels-Alder reactions with high activation energies, and polar Diels-Alder reactions with low activation energies ,[3+2]cycloaddition (32CA) reactions lack a clear systematisation of their reactivity based on the nucleophilic/electrophilic behaviour of the reagents. 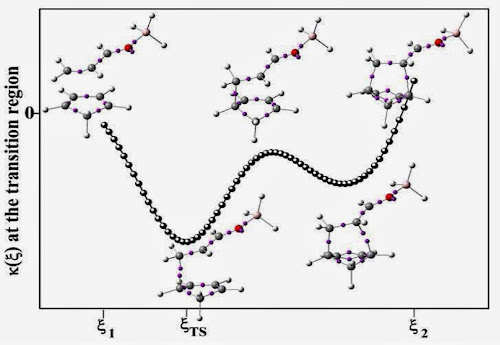 Very recently, we performed a structure/reactivity relationship study about the 32CA reactions of twelvenon-substitutedTACswith ethylene and acetylene, finding that the high reactivity of some TACs is due to itspseudodiradicalcharacter . This study allowed establishing a useful classification of 32CA reactions intopseudodiradical-type (pr-type)reactions involving TACs with a highpseudodiradicalcharacter, which take place easily through an earlier TS with non-polar character, andzwitterionic-type(zw-type) reactions involving TACs with a high zwitterionic character, characterised by favourable nucleophilic/electrophilic interactions, taking place through polar TSs . 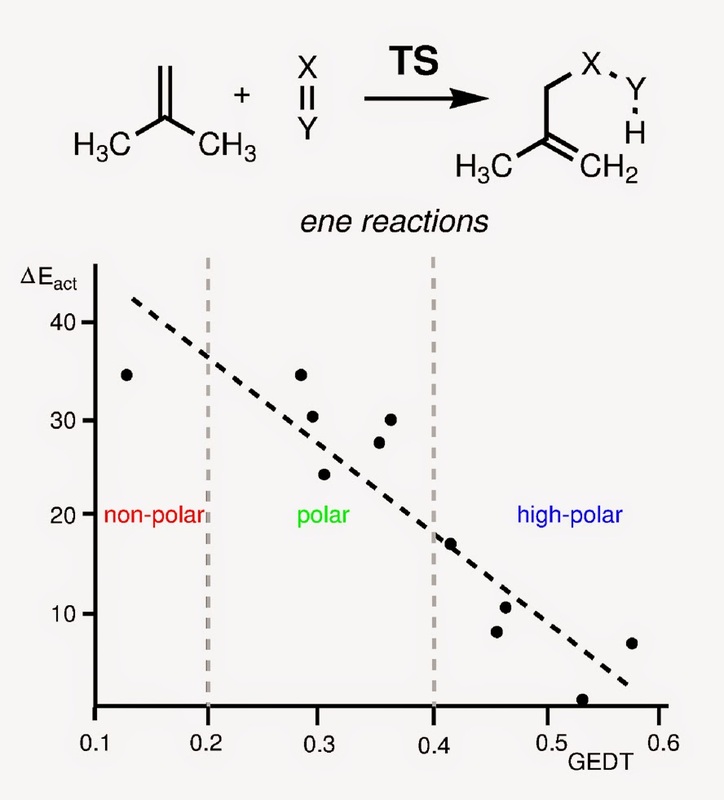 Considering that the simplest TACs of this series having a zwitterionic character presented low reactivity in non-polar processes towards ethyleneand acetylene, would be expected that the nucleophilic activation of these TACs and the electrophilic activation of ethylene, or vice versa, will favour the process towards a polar zw-typereaction. In the present manuscript, a set of seven non-substituted TACs,showing a zwitterionic structureand low reactivity towards ethylene, has been studied using and nucleophilicity N reactivity indiceswthe electrophilicity defined within the conceptual DFT at the B3LYP/6-31G(d) level of theory. The general characteristic of these TACs is their high nucleophilic and a low electrophilic behaviour. 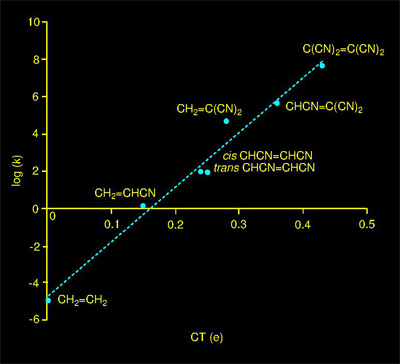 Activation energies of the corresponding 32CA reaction computed at theMPWB1K/6-311G(d) level in dichloromethane point to that non-substituted TACsreact quickly toward dicyanoethylene showing their ability to react towards electron-deficient ethylenes. However, when the TACs are electrophilically activated by an appropriate substitution thereseems to be insufficient activation to react toward electron-rich ethylenes. The electrophilic activation of the TAC moiety for nucleophilic attacks was only determined by the coordination with a Lewis acid. All 32CA reactions studied in this work presented high regioselectivity. The polar character of these 32CA reactions is associated with the global charge transfer found at the TS, which is in agreement with azwitterionic-type(zw-type)mechanism. According to our results, the present theoretical study suggests that the substitution is required in both, TACs and the ethylene species, in order to experimentally perform these zw-type 32CA reactions under mild conditions. 1. 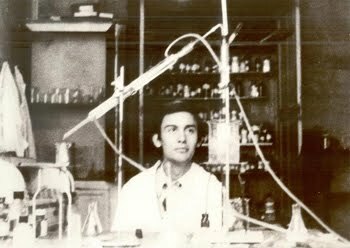 Domingo, L. R.; Sáez, J. A.Org.Biomol. Chem.,2009,b7, 3576-3583. 2. Ess, D. H.; Houk, K. N. J. Am. Chem. Soc. 2008, 130, 10187-10198. 3. Domingo, L. R.; Saez, J. A. J. Org.Chem. 2011,76, 373-379. The mechanism of ionic Diels-Alder reactions. A DFT study of the oxa-Povarov reaction. The mechanism of the of ionic Diels-Alder (I-DA) reactions involved in oxa-Povarov reaction of a cationic aryl oxonium with cyclopentene and styrene has been studied using DFT methods at the B3LYP/6-31G* level. While the I-DA reaction with cyclopentene takes place along atwo-stage one-stepmechanism, the presence of a phenyl substituent in styrene makes the mechanism of the I-DA reaction stepwise. An electron localization function (ELF) bonding analysis of selected points along the IRCs of these I-DA reactions allows the establishment of a great similarity in bond formation along both one-step and two-step mechanisms. 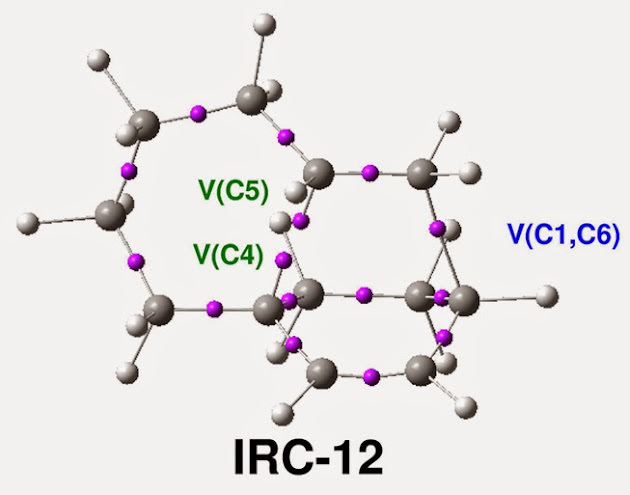 The formation of the first C-C single bond begins in the short range of 1.95 - 1.90 Å, by the coupling of twopseudodiradicalcenters generated at the most electrophilic center of the cationic aryl oxonium and the most nucleophilic centers of cyclopentene and styrene, resulting in the global charge transfer that takes place along I-DA reactions. The use of the recently proposed radical Parr functions allows the characterization of the most electrophilic centers in cationic species and the most nucleophilic centers in anionic species. An quantum chemical topological analysis of selected points along the IRCs of the one-step mechanism of the I-DA reaction between cationic aryl oxonium 6 and cyclopentene 7, in red, and the two-step mechanism of the I-DA reaction between 6 and styrene 12, in blue, allows the establishment of a great similarity in single bond formation along the two mechanisms. Both one-step and two-step mechanisms are non-concerted processes. The reaction force constant, κ(ξ), together with the electron localization function (ELF) analyses of the bonding changes along the intrinsic reaction coordinate (IRC) associated with the polar Diels-Alder (P-DA) reaction between cyclopentadiene and the acroleine:BH3 complex have been studied. For this P-DA reaction, κ(ξ) presents a negative maximum with minima on both sides. 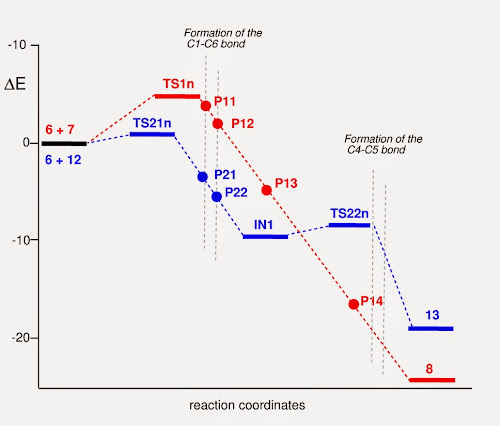 The IRC point associated with this maximum shares the reaction path into the two-stages associated with the formation of each one of the two C-C single bonds. 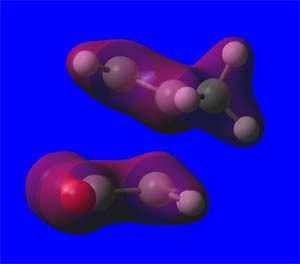 The topological ELF analysis of this point shows that while the first C-C single bond is practically formed, the formation of the second C-C has not started yet. 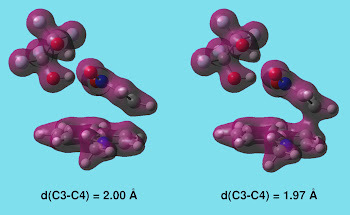 Both, κ(ξ) and the ELF topological analyses of the structures involved in the reaction path corroborate that the formation of the two C-C single bonds is non-concerted. 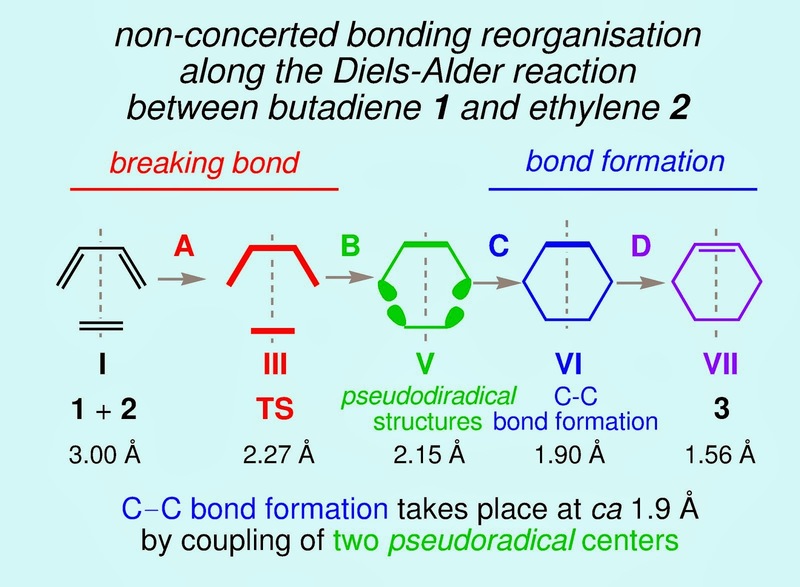 Bonding changes along the Diels-Alder reaction between butadiene 1 and ethylene 2 and related non-polar Diels-Alder reactions have been analysed using the bonding evolution theory (BET). Changes in electron density instead of molecular orbitals are used to rationalise the reaction mechanism. The electron localisation function (ELF) analysis indicates that C-C bond formation takes place by the C-to-C coupling of two pseudoradical centers formed along the reaction. The present review permits the establishment of two significant findings: i) the breaking of the C=C double bonds in butadiene 1 and ethylene 2 and the formation of the C-C single bonds in cycloadduct are non-concerted due to the changed in electron density required for the formation of the pseudoradical centers, and ii) the symmetric changes in electron density along these cycloadditions do not have a cyclic movement. These behaviours, which are opposite to the "concerted" and "close curve" bonding changes proposed for the pericyclic reactions allow to refute the pericyclic mechanism for Diels-Alder reactions. Understanding the Mechanisms of [3+2] Cycloaddition Reactions. The Pseudodiradical versus the Zwitterionic Mechanism. Analysis of the electronic structure of twelve three-atom-components (TACs), and their participation in [3+2] cycloaddition (32CA) reactions towards ethylene and acetylene allows establishing a useful classification of 32CA reactions into zw-type reactions involving TACs with a high zwitterionic character, and pr-type reactions involving TACs with a high pseudodiradical character. 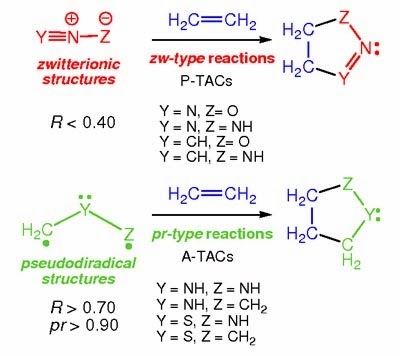 While propargylic-type TACs react towards a zw-type mechanism, some allylic-type TACs such as carbonyl and azomethine ylides, which present a high pseudodiradical character, appear to react quickly towards a pr-type mechanism. This new classification improves the earlier classification made by R. Sustmann (Pure Appl. Chem., 1974, 40, 569) in normal- and inverse-electron demand reactions, since this does not report any information about the polar or non-polar nature of the reactions, nor about the feasibility of the reaction. A base catalysis in the C-C bond-formation on the NHC catalysed addition of enols to acyl-azoliums. Org. Biomol. Chem., 2014, 12, 895-904. A DFT study (MPWB1K/6-31G**) of the NHC catalysed Michael addition of enols to a,b-unsaturated acyl-azoliums shows that along the direct and the conjugated additions, formation of a hydrogen bond of enols with the carboxyl oxygen is not sufficient to favour the C-C bond formation as a consequence of the low nucleophilic character of enols. Interestingly, when enols form a hydrogen bond with the chloride counterion, the activation energies associated with the conjugated addition decrease as a consequence of the increased nucleophilic character of enols and the increased electrophilic character of the 'acyl-azolium + Cl' ion pair. Analysis of the DFT reactivity indices allows establishing a base catalysis for the C-C bond-formation step promoted by the chloride counterion . The Mechanism of the Diels-Alder Reaction. In 1942 R. B. Woodward published a communication to the editor of the J. Am. Chem. Soc. titled "The Mechanism of the Diels-Alder reaction" (J. Am. Chem. Soc. 1942, 64, 3058), in which he proposed an ionic mechanism based on the electron transfer from a substance, e. g., a diene, of relatively low ionization potential and, on the other, a molecule of high electron affinity, e. g., a a,b-unsaturated carbonyl compound. This communication can be considered the earliest theoretical proposal of our polar Diels-Alder mechanism (Org. Biomol. Chem. 2009, 7, 3576). Building upon our recent studies devoted to the bonding changes in polar reactions [186, 188], we have proposed two new electrophilic,P+, and nucleophilic, P-, Parr functions based on the spin density distribution at the radical anion and at the radical cation of a neutral molecule . These local functions allow for the characterisation of the most electrophilic and nucleophilic centres of molecules, and for the establishment of the regio- and chemoselectivity in polar reactions. The proposed Parr functions are compared both ,with the Parr-Yang Fukui functions [J. Am. Chem. Soc. 1984, 106, 4049] based on the frontier molecular orbitals, and Yang-Mortier condensed Fukui functions [J. Am. Chem. Soc. 1986, 108, 5708] based on Mulliken charges . Parr functions derived from the atomic spin density of the cation, anion and neutral radicals. Electrophilic and nucleophilic Parr functions in an intramolecular Diels-Alder reaction. C3-C4 bond formation by C-to-C coupling of two pseudoradical centers located on the C3 an C4 atoms. The topologic ELF analysis of the C-C bond formation in the Friedel-Crafts reaction between indoles and nitroolefins indicates that it takes place by a C-to-C coupling of two pseudoradical centers located at the most electrophilic center of nitroethylene and the most nucleophilic center of N-methyl indole . These relevant centers are achieved via the global charge transfer process that takes place from nucleophilic indole to electrophilic nitroethylene . This reactivity model, which is shown in polar Diels-Alder and 1,3-dipolar cycloaddition reactions [186, 200 and 201] , is opposite to that in which indole attacks nucleophilically to the conjugated position of nitroethylene. At 2.00 Å it can be observed the gathering of electron density on the most nucleophilic center of indole and on the most electrophilic center of nitroethylene. Note that the electron density accumulation at the most electrophilic center of nitroethylene, which is in agreement with my definition of electrophilic center [186 and 202], is contrary to the accepted definition of center with electron deficiency. The charge transfer (CT) found at the TSs of Diels-Alder reactions controls the activation energies of this type of cycloaddition reactions . This behaviour has allowed to classify Diels-Alder reactions as non-polar (N-DA) and polar (P-DA). The polar character of Diels-Alder reactions, and thus their experimental feasibility, can be anticipated analysing the electrophilic and nucleophiles behaviours of the diene and the ethylene. These proprieties of the organic molecules can be easily obtained by means of the electrophilicity and nucleophilicity indices defined within the conceptual Density Functional Theory (DFT). 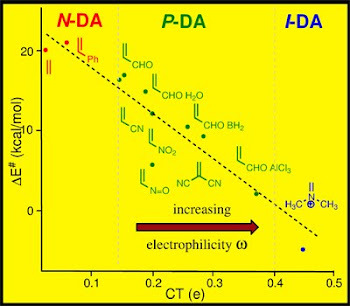 A good correlation is found for the P-DA reactions between Cp and the tetracyanoethylene series. Electrophilic centres have been related with positively charged centres. Thus, in carbonyl compounds, the carbon atom is associated with the most electrophilic atom. Our recent studies have established that the most electrophilic centres are those receiving most of the electron density along the global charge transfer from the nucleophile to the electrophile. Thus, in benzoquinones, the most electrophilic centres are oxygen atoms, in spite of being negatively charged . Analysis of the recently proposed Parr functions allows for the characterization of the most electrophilic and nucleophilic centres of a molecule . We are pleased to announce that our Special Issue on “Understanding Heterocycloaddition Reaction by means of the Molecular Electron Density Theory” in Heteroatom Chemistry has just gone online! Find more information at https://www.hindawi.com/journals/htrc/si/137424/cfp/ You can pass on the link to any collaborator interested. We hope that this special issue attracts your interest and you can contribute to its success. 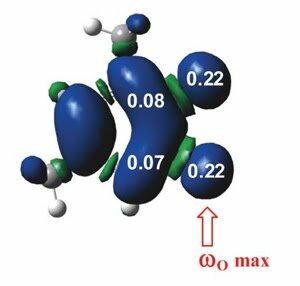 Unveiling the high reactivity of cyclohexynes in [3 + 2] cycloaddition reactions through the molecular electron density theory. Org. Biomol. Chem. 2019, 17, 498–508. Unravelling the Mysteries of the [3+2] Cycloaddition Reactions. Eur. J. Org. Chem. 2019, 267–282. 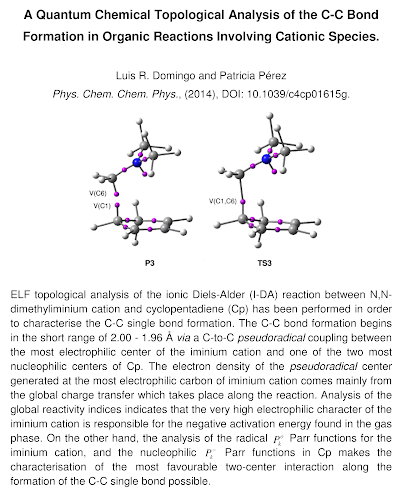 A Molecular Electron Density Theory Study of the Reactivity and Selectivities in [3+2] Cycloaddition Reactions of C,N-Dialkyl Nitrones with Ethylene Derivatives. J. Org. Chem. 2018, 83, 2182−2197. The Mysticism of Pericyclic Reactions. A Contemporary Rationalisation of Organic Reactivity Based on the Electron Density Analysis. Eur. J. Org. Chem. 2018, 1107–1120. A Molecular Electron Density Theory Study of the Competitiveness of Polar Diels-Alder and Polar Alder Ene Reactions. Molecules 2018, 23, 1913. A Molecular Electron Density Theory Study of the Role of the Copper-Metallation of Azomethine Ylides in [3+2] Cycloaddition Reactions. J. Org. Chem. 2018, 83, 10959–10973. A Molecula Electron Density Theory Study of the [3+2]Cycloaddition Reaction of Nitrones with Strained Allenes.RSC Adv.,2017, 7, 26879. A Molecular Electron Density Theory Study of the Reactivity of Azomethine Imine in [3+2]Cycloaddition. Reactions. Molecules 2017, 22, 750. Publications catalogued as "very cited article" in the Web of Science. (31/3/2019) Publications:a new accepted article (305). (21/2/2019) Publications:a new accepted article (304). (14/2/2019) Publications:a new accepted article (303). (14/1/2019) Publications:a new accepted article (302). (2/1/2019) Publications:a new accepted article (301). (27/12/2018) Publications:a new accepted article (300). (19/12/2018) Publications:a new accepted article (299). (4/11/2018) Publications:a new accepted article (298). (6/10/2018) Publications:a new accepted article (297). (28/7/2018) Publications:a new accepted article (296). (27/7/2018) Publications:a new accepted article (295). (24/7/2018) Publications:a new accepted article (294). (17/7/2018) Publications:a new accepted article (293). (13/7/2018) Publications:a new accepted article (292). (24/4/2018) Publications:a new accepted article (292). (1/2/2018) Publications:a new accepted article (291). (23/1/2018) Publications:a new accepted article (290). (18/1/2018) Publications:a new accepted article (289). (3/1/2018) Publications:a new accepted article (288). (2/1/2018) Publications:a new accepted article (287). (30/12/2017) Publications:a new accepted article (286). (15/12/2017) Publications:a new accepted article (285). (9/10/2017) Publications:a new accepted article (284). (28/09/2017) Publications:a new accepted article (283). (4/09/2017) Publications:a new accepted article (282). (31/08/2017) Publications:a new accepted article (281). (21/08/2017) Publications:a new accepted article (280). (28/07/2017) Publications:a new accepted article (279). (22/06/2017) Publications:a new accepted article (278). (20/06/2017) Publications:a new accepted article (277). (10/05/2017) Publications:a new accepted article (276). (30/04/2017) Publications:a new accepted article (275). (10/04/2017) Publications:a new accepted article (274). (28/02/2017) Publications:a new accepted article (273). (6/02/2017) Publications:a new accepted article (272). (16/01/2017) Publications:a new accepted article (271). Otto Diels and Kurt Alder, Synthesen in der hydroaromatischen Reihe, Justus Liebigs Annalen der Chemie, 1928, 460, 98–122. -The two new C-C bonds are not yet formed at the TS. -There are an accumulation of electron density at the more electrophilic centers of anhydride maleic and the more nucleophilic centers of cyclopentadiene. - There are not any orbital interaction explaining the endo selectivity. 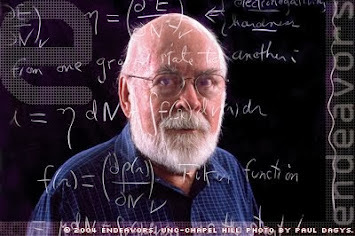 R. Parr has participated in the definition of the most significant reactivity indices defined within the conceptual DFT.